Are you bored of usual Google logo and want Google homepage with colorful Google logo doodles? You can easily do this in few simple clicks on Chrome browser using ‘Favorite Doodle’ extension. It allows you to select and display Google logo doodle of your choice on Google Search homepage in your Google Chrome browser. 1. Launch Google Chrome browser and open Favorite Doodle extension. 2. Install then extension and then open google.com in Chrome browser. 3. Click on Google logo to open Doodle Gallery. 4. Then click “Make this my favorite doodle’ button under doodle logo of your choice. 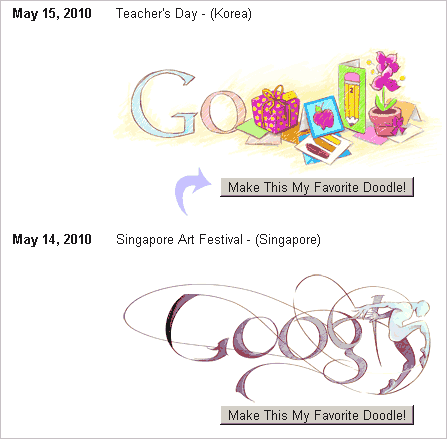 The selected doodle image will start appearing on Google homepage instead of usual Google logo. Now you can put Pacman game doodle and any other doodle forever on your Google homepage. Ready for quick change? Great! Now I can continue playing my pac man~!